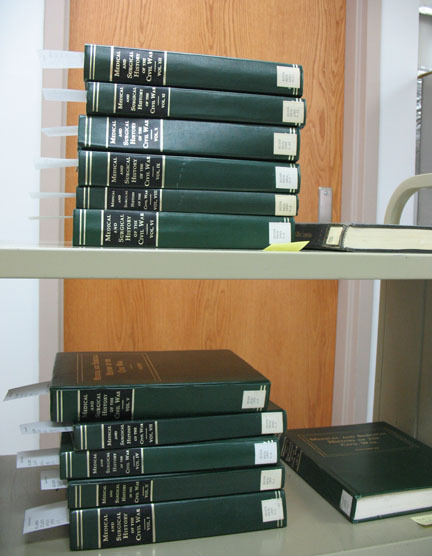 Recently, a 12-volume set of Civil War histories was returned to the Library after being kept by a patron for several years. The books reeked of cigarette smoke. The odor was chokingly strong even from several feet away. Reluctant to return the items to the collection in their current state, Circulation brought them to the Conservation Lab to find out what could be done. Leaving the book, fanned open, under a fume hood for a few weeks to air out. Leaving the book outside in fresh air (climate dependent) to air out. 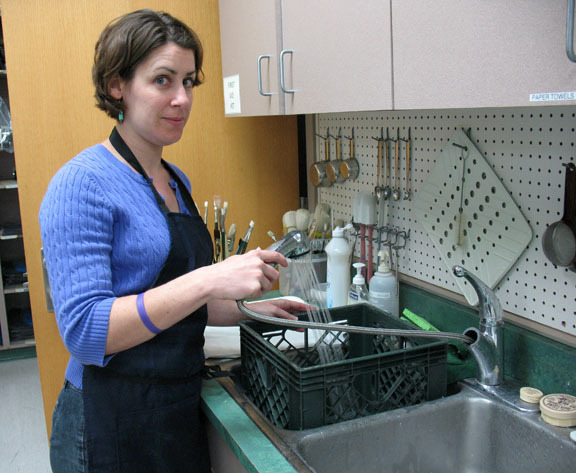 Interleaving the book with paper towels and then putting it in the freezer. Sealing the book in an airtight container along with an odor-absorbing compound (such as unscented clay kitty litter, charcoal briquettes, or a proprietary odor remover) for up to a month. Since the book cart of smoky books was filling our work area with the unpleasant, stale odor of lingering cigarette smoke, we moved them under the fume hood while we decided on a more aggressive course of action. 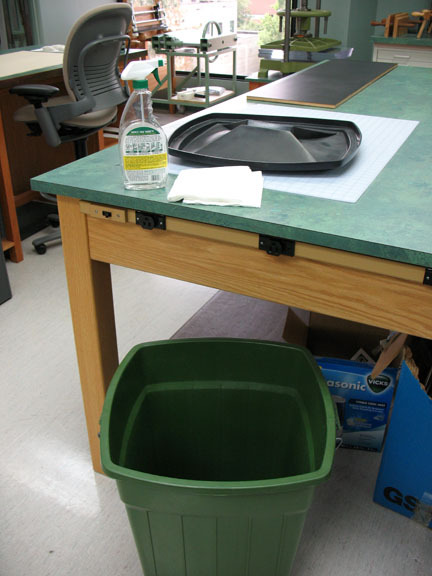 The fume hood gets regular use, so leaving the books there for several weeks would not be a desirable option. We lack a safe outdoor space in which we could fan out the books in fresh air, and even if we had such a space, the weather here in Iowa has been experiencing such dramatic, unpredictable swings that we nixed the idea. The freezer method lacks a convincing grounding in chemistry, and our freezers are currently full of books being freeze-dried. So, we settled on the sealed-container method of odor removal. In the past, I’ve used clay litter, which has worked to varying degrees, and also takes quite some time (up to a month). We decided instead to test a product specifically marketed as an odor remover. Gonzo Odor Eliminator for Homes was recommended to us by the University of Iowa Preservation Department. The product is comprised of “non-toxic, environmentally safe volcanic minerals,” which have a negative charge that attracts positively-charged odors. Each 32-0z. mesh bag allegedly eliminates odors in a space up to 600 square feet within 8 hours. This claim raised our expectations considerably! We put the smoky books in a chamber with the Gonzo Odor Eliminator on a Friday afternoon, and by the time I checked them the following Monday morning, the smoke smell was already gone — even when I fanned through the textblock pages. The smoky volumes are so large that only 3 fit in the chamber at a time, but with such a quick turn-around for effective odor removal, we will be able to cycle through the entire batch by early next week. 1. First, I located a disused trash-can style humidity chamber in our storage closet. I wiped down the inside surfaces of the container with a non-toxic, biodegradable spray cleaner and let it air out. 2. Next, I scrubbed down one of the packing crates we typically use for disaster salvage with soap and water, and then let it dry. 3. 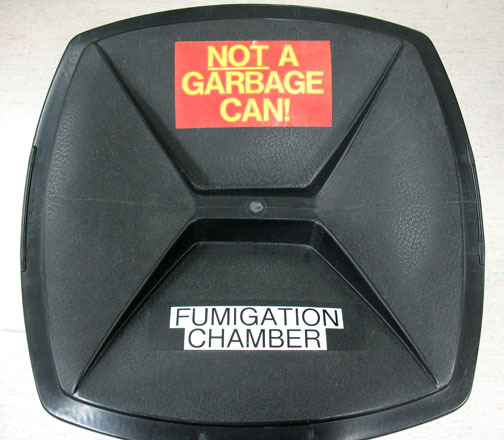 Before going any further, I labeled the lid of the container. 4. 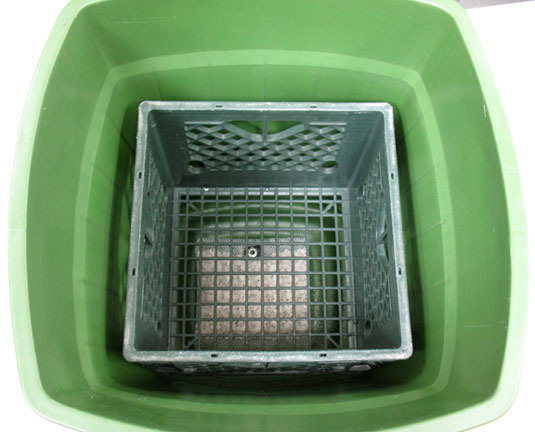 Placing the Gonzo mesh bag in the bottom of the container, I nestled the packing crate into the bin. 5. I fanned out the books (standing on end) in the crate, and covered the plastic bin. 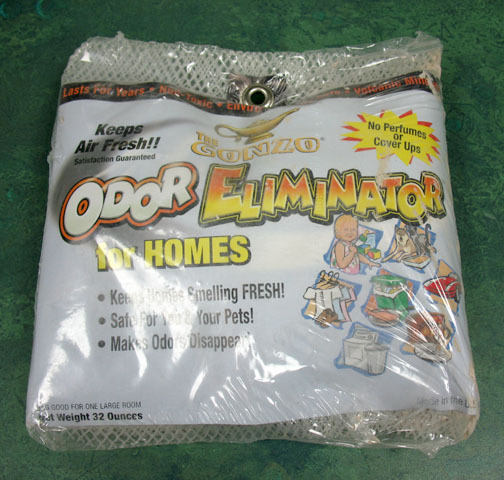 I then left the Gonzo Odor Eliminator to do its work, which it accomplished effectively in just a couple of days. Just curious – does the Gonzo smell like smoke when you’re done? Great question, Sarah. I just put it to the sniff test, and I would say the Gonzo does smell like smoke, but only very slightly. I had to put my nose right up to the mesh bag to detect it. According to the packaging, the bag of volcanic minerals can be placed in direct sunlight for a few hours to recharge its odor-capturing capabilities. Good call on labelling the trash can! Thanks, Whitney. I was pretty sure that was an Unfortunate Event waiting to happen! I do think you’ll want to use a sealed bin for best results. Ours is not airtight, but the lid snaps into place, and we place a few bricks on top of it to weight it down further. Good luck! We tried your technique. Worked for us too. Thanks! Thanks for letting us know it worked, Janice! We’re glad to help. Thank you for posting this! I’m setting up one of these at our library, and what you shared is helpful. Thanks for letting us know this was a helpful post, Anne. We appreciate the feedback. 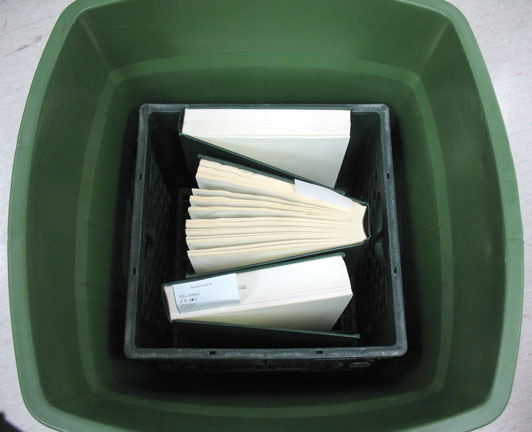 Good luck with your library’s stinky books!